Produced from seasoned hardwoods such as beech, oak, ash and sycamore. The moisture content has been reduced by pre-splitting and air drying to around 30% moisture. This ensures that the wood burns readily giving off a good heat. It will not throw sparks as softwood does and won't lie there hissing needing a good fire to burn it! Our firewood is not supplied by “the load” - a vague measure, or by “the tonne” - which is totally dependent on moisture content – the wetter the wood, the heavier it is. 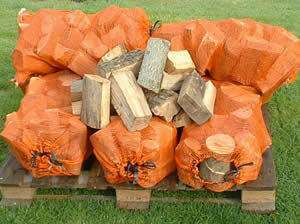 We supply split, seasoned hardwood firewood in __ litre nets, bulk bags or bulk ( measured in cubic metres). This ensures that customers receive a consistent amount of a reliable, quality product. If you have any other specific size requirements or requests, contact us. 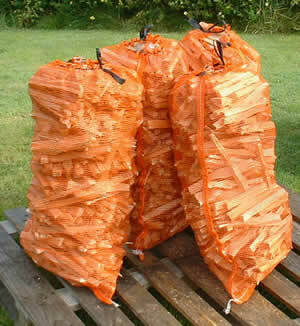 Dry softwood kindling is supplied in__ litre nets. 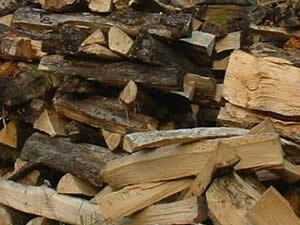 Delivered free with firewood orders, or on orders of 10 nets or greater. Chips designed as fuel for automated woodchip heating boilers are available in cubic metre bags, or bulk tipped for larger installations. 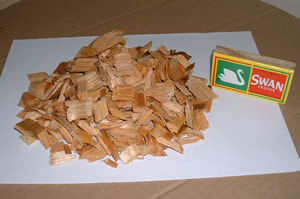 Wood chips of a variable moisture content and size can be supplied to suit customer's particular requirments. A dense, high energy product which flows readily and is ideally suited to the domestic user. Supplies of 6mm wood pellets are available in 15kg bags or 500kg bulk bags, contact us for more information. 8mm pellets can also be sourced.